Today I’m going to sharing some thoughts about a topic that is really important to me, and affects everyone. Arguably one of the biggest issues that young and old people alike in today’s world, is low self-esteem. With a constant slew of photo-shopped, airbrushed and perfected people in the media being pushed down our throats on a daily basis, it comes at no surprise. Comparing ourselves to a photograph that a professional has spent hours editing and perfecting can be pretty awful. I’m sure we’ve all experienced the sinking feeling of dissatisfaction in ourselves at some point. Firstly, I’m here to tell you that you’re not alone. Your feelings are valid, and you’re not being silly. Next, I’m hear to hopefully teach you some things (with some help of wise and insightful people) that’ll hopefully set you on a path of self-acceptance. Accepting your body with all its flaws, and appreciating everything it does for you can lead you to feel so much more confident in your own skin and ultimately bring you more happiness. Also, remember that you are not defined by the way you look. Appearance isn’t everything. After all, its pretty hard to feel bad about your body once you start thinking about the billions of cells and micro-organisms whose only care and purpose is keeping you alive and healthy. Now, I definitely don’t consider myself an expert, and body-positivity is definitely something I still struggle with, but I’m learning and slowly making progress, day by day. Patience, dear hearts. “My first tip when it comes to embracing your body and becoming more body positive in general is to stop playing the comparison game. This can be extremely tough as we’re bombarded with images of other people on social media who appear to always look amazing and have everything in their lives sorted out. But this isn’t true – nobody is perfect and what you’re seeing is a carefully curated photo or caption and not the complete reality of that person’s life. So if need be, unfollow accounts that make you feel bad about yourself or that make you want to compare yourself. Only follow people that inspire, encourage and uplift you. In real life, whenever you feel the need to compare yourself or your body to someone else, remember that you were created to be unique and that there is beauty in diversity. Also, remind yourself of all the amazing things that you can do, like a handstand or a dance or that your body keeps you alive and healthy! This quote really sums up what learning to like your body, no matter it’s shape or size, is about. 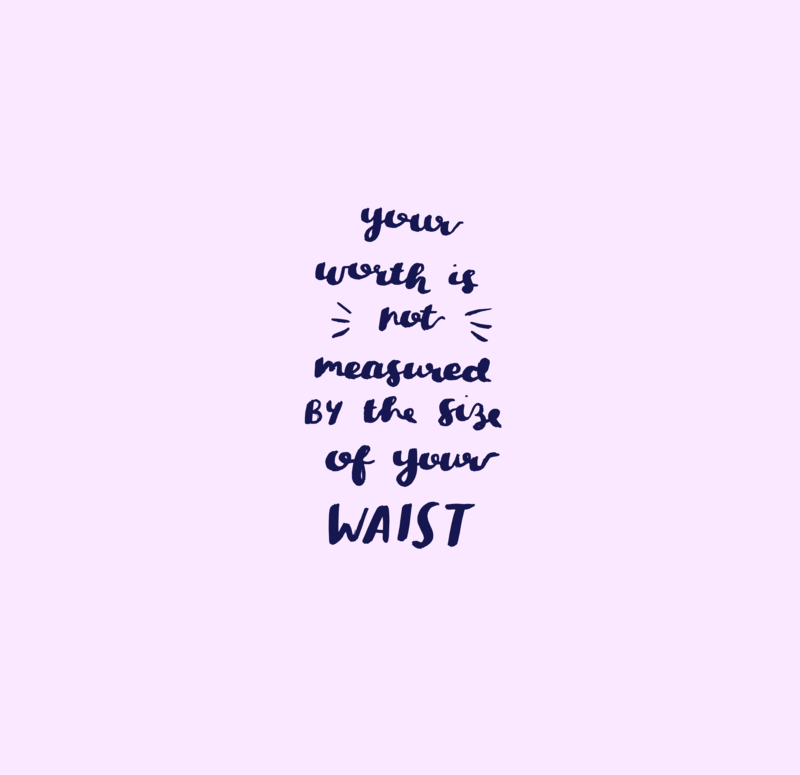 When we start to see our worth in more than our clothing size or weight on the scale, we are able to live our lives to the fullest! There is so much learning to be done, and such a long way to go, but I really hope you have found some value in this. If you are truly happy within yourself, very little will get you down. Keep spreading love. I’ve created this little print-out that you can stick on your wall, just as a tangible reminder.